Together we'll meet a 65-million-year-old Tyrannosaurus rex specimen, nicknamed "Wyrex." It's being excavated in Montana by Black Hills Institute, a fossil company from Hill City, South Dakotaand by you! This web site will introduce you to the excitement of digging a T. rex, and show you how accessible working with fossils can be! Black Hills Institute of Geological Research is co-hosting "100 Years of Tyrannosaurus rex" A Symposium. 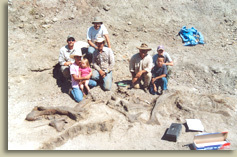 Visit Black Hills Museum of Natrual History's site for more information. Field Journal: Starting May 10th, 2004, check in daily to see what's new. The Field Journal will be updated with facts, stories, interviews and semi-live content directly from the dig as it happens! Dinosaur digs can be as short as a couple of weeks, so stay tuned. This section includes: a Daily Journal which details each day's progress and events; an interactive Bone Map & Specimen Notes that will grow as the dig progresses; and, an opportunity to Meet the Dig Team of paleontologists. Drop by now to check out what was originally discovered. T. rex In-depth: When you're not delving into the dig happenings, investigate T. rex In-depth, including its Anatomy, Traits, Behavior, Territory, and History. How did this critter's body work? Do we know for sure, or are scientists still developing theories? Where and how did T. rex liveand why do we think we know? What was the environment like? Who lived there with T. rexor, most likely, who was listed on its menu? 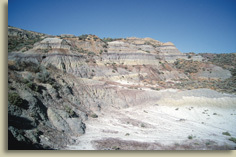 Paleontology: Bone up on the science of Paleontology, with explorations into the workings of a unique discipline. Get to know the kinds of People who discover, study, and work with fossils. Research how Fossils are created, found, cleaned, put back together, and studied. Find out how the Science of paleontology is practiced both in the field and in the lab, and which other sciences form its foundation. Participate! : You can Participate in our dig by sending Questions directly to our dig team and checking out cool group or classroom Activities. This is the first time the excitement and science of an actual T. rex dig has been shared with the worldDrop by and get involved! Press Releases: Interested in covering this exciting event in your newspaper, magazine, or web site? Visit the Press Releases section and get the facts in a concise format, browse high-quality photos and video that you can utilize, and gather contact information for building your story. Sponsors: How did this site become a reality? It was due to these Sponsors and their desire to support quality, educational-based scientific endeavors. Check out these interesting organizations and you will find many avenues of discovery and learningand maybe a natural science item or book to add to your collections. Check out the Field Journal section for info on the initial discovery, and the Press Releases section to download recent info about this site's launch. Browser: Version 5 or higher of Internet Explorer or Netscape. Any recent version of a modern browser like Safari, OmniWeb, Mozilla, or Opera. In addition, your browser will need to allow cookies and pop-up windows generated from this site. Multimedia: Pop-up multimedia presentations require the QuickTime browser plug-in version 5.0.2 or higher (with the Zoomify component - QuickTime installs components automatically as needed). Brought to you by Black Hills Institute of Geological Research, Inc.
QuickTime, the QuickTime Logo, Mac, and the Mac logo are trademarks of Apple Computer, Inc., registered in the U.S. and other countries. The Get QuickTime Badge and Made on a Mac Badge are trademarks of Apple Computer, Inc., used with permission. Zoomify is a trademark of Zoomify, Inc.